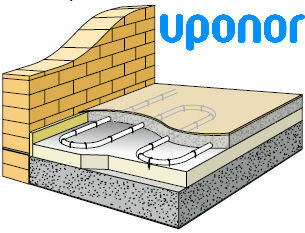 Underfloor Heating was first introduced by the Romans over 2,000 years ago. They had empty spaces under the floors, such as cellars, and would light a furnace and let the warm air circulate around the cellar and warm the floors of the rooms above. To heat the rooms on the first floor, the heat from the furnace would run up channels in the walls running to the rooms above. Modern underfloor heating delivers a near perfect temperature profile between floor and ceiling due to a balanced combination of radiant and confected heat. By using radiant heat underfloor heating ensures you feel comfortable even at a lower air temperature than that produced by a more conventional heating system. With conventional central heating, the majority of heat is confected air, which rises, making the ceiling one of the warmest places in the room. However, 50% of the warmth generated by underfloor heating is radiant heat, where the floor releases heat evenly, which is then absorbed by people and objects in the room with very little managing to escape. Ideal comfort conditions are created - warm feet, cool head; just perfect for relaxation. If you walk into a home controlled by underfloor heating, you should be able to tell the difference almost immediately. There are also fewer floor covering restrictions and underfloor heating is suitable for use with all finishes including carpet, lino, hardwood, laminate and stone.